About 65 people gathered January 21 at the Community Center for a spirited public discussion about Altadena’s park needs. 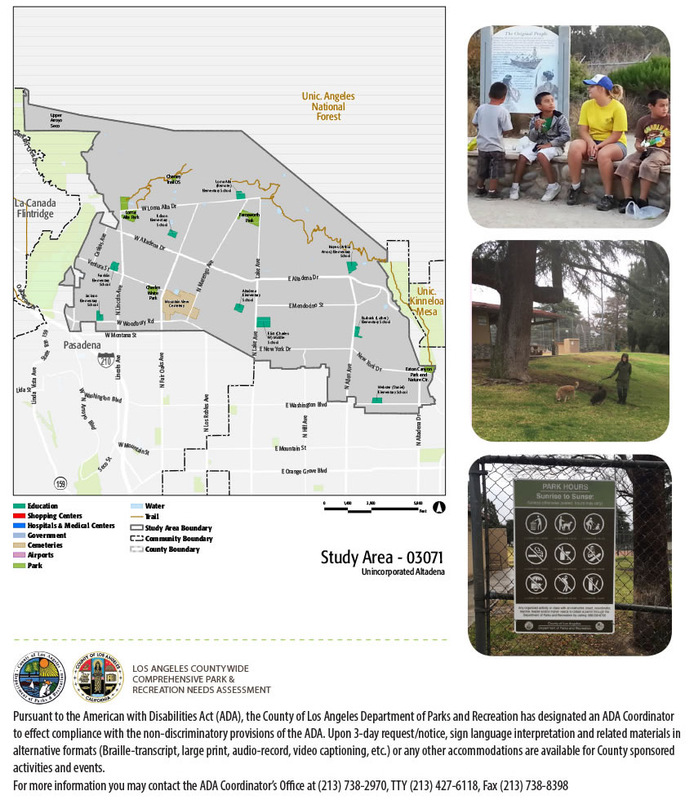 Altadena Heritage hosted the gathering for Los Angeles County as part of a major planning project that combines a survey of current park resources with citizen input to determine future priorities. Such meetings all over the county’s incorporated and unincorporated areas yielded community-created project lists that will be used to write a bond issue to fund parks and recreation infrastructure that citizens will vote on in the future. 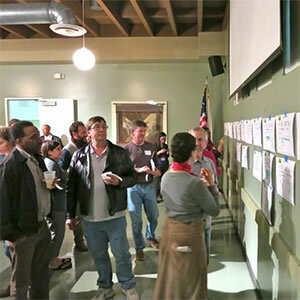 Everyone’s voice was heard, and we voted to come up with a list of Altadena’s priorities. All ideas were recorded and will be included in a report to County Parks Department officials. From closing gaps in the Altadena Crest Trail, to urban trails, dog sport fields, a teen center, and infrastructure improvements at Farnsworth and other parks, there was no shortage of good ideas on how to make our community a healthier place. Submitted by Michele Zack, meeting facilitator for Altadena Heritage, community group conducting LA County’s Parks Assessment Public Meeting. The meeting held at Altadena’s Community Center January 21, 2016 was lively and well attended. Sixty-two residents, many with deep experience and feelings about Altadena’s recreational offerings, engaged directly to voice opinions about our park needs and priorities. Varied interests and points of view were all heard, yet everyone was civil. Projects voted the top ten are listed, along with others suggested, below. Important to note is that human error played its usual role. By mistake, one project — infrastructure and surrounding hardscape improvements at Loma Alta Park of Equestrian Ring — was not posted on the wall until voting was almost closed. 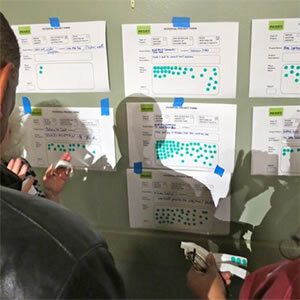 This occurred as team members scrambled to sort through and transfer notes from giant easel pad to project description sheets posted on wall — yet it still received 18 votes. Another proposed project, an urban trail system, also went up late, 10 minutes into voting process, yet still received enough dots to come in #3! Both would probably have received more support if they had been posted at the same time as others. Thought our process was not perfect, it yielded valuable data for future budgets and planning. The top 10 projects, each followed by number of votes it received, follows. More detail is provided in Appendix G for these projects. Clearly, it is impossible to come up with a completely thoughtful and comprehensive list of the most important priorities for Altadena parks in a 2-hour public meeting. The goals were to let everyone be heard and to come up with prospective project ideas, and these were achieved. Overall, it was a valuable process that yielded good ideas, some of which do not exactly fit into confines of LA County’s specific definitions of allowable projects. Yet they all deserve to be considered, and we hope County planners will not miss the forest for the trees or dismiss projects out of hand because they do not exactly fit into the boxes created for us! It is significant that half of top six vote-getting projects supported by Altadenans have to do with trails, connectivity, and having safe, pleasant, and informal places for healthy exercise in town and in adjacent mountains. A total of 136 votes were cast for such projects! Another significant interest is for a place where people may recreate with their dogs; two projects of this type received a combined 63 votes. A total of 75 votes targeted use of county-owned land adjacent to Farnsworth Park for this or another purpose. Our park metrics and community profile snapshot clearly indicate that of our 3 main parks, Charles White has the greatest surrounding population density, and people living nearby comprise our most underserved population. That community members recognize this is reflected in a combined 130 votes cast for improvements that would benefit this park. Some of these (including the teen center, lighting, ADA compliance, splash pads) weren’t specified exclusively for Charles White — however, this is Altadena’s neediest park by every measure. In prioritizing projects, budgets, and schedules, we hope planners will take this into account. I would like to thank the team who helped prepare for and put on this meeting. From Altadena Heritage, this included Linda World, Mark Goldschmidt, and myself, from Altadena Town Council Anne Chomyn, and from LA County Parks Department Sheela Mathai, Meliza Hernandez, and Olga Ruano. Additional volunteers from Altadena Heritage helped with set up, refreshments, and cleanup.